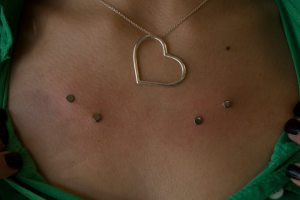 As clear with name Chest piercings are dermal piercings just above the sternum or chest area. 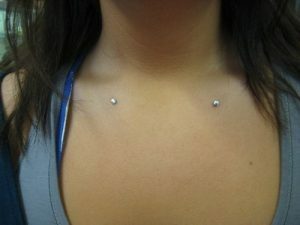 They are thus also known as pre-sternum or Chest Dermal Piercing. It lies in the center region on breastbone below the neck. They gradually gaining popularity among people as they find it to be different and unique liked by both male and females equally. 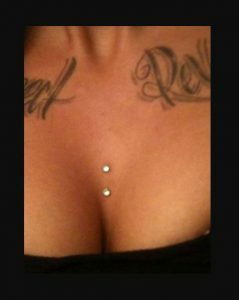 However it is generally known as Cleavage Piercing for females. Its orientation is either vertical or horizontal depending on the choice of the individual. The location is very crucial, so it is advisable to carry out the piercing process at a well known reputed parlor. The standards for clean and hygienic surroundings should match the expectation. 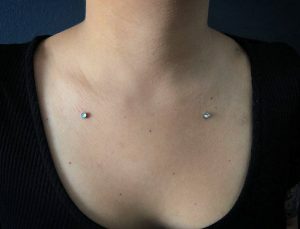 Also, take advice on whether it is suitable for your anatomy as it is important that there is some loose skin in the region to get these piercings. Clean the chest area with an antibacterial solution to disinfect it. Insert a thin hollow needle to make the hole in the chest region. Place the jewelry in the perforation. 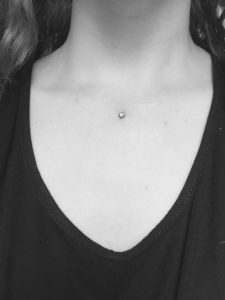 The pain reports reveal that surface chest piercing are slightly more painful as compared to any other surface piercings due to their location and although some even rate it to be moderate. It entirely depends on the individual’s pain tolerance capacity. Some swelling, twinge, and redness can last for a few days. The piercing can take 4 to 6 weeks to completely recover. It, however, depends majorly on maintenance and aftercare, because the infection can lead to prolonged healing. Touch the piercings with clean hands disinfected with antibacterial soap. Pat the area dry with clean paper towels after taking a shower. Dab the area with a swab of cotton soaked in the warm saline solution. Refrain from use of cream, lotion, moisturizer, deodorant or perfumes on the piercing. Play or fiddle with jewelry. Sleep on the front side. Wear tight clothes around that area. Rather, try wearing long or deep necks to prevent injuries from tangling of clothes. Do not remove the jewelry as it will clog the pore. Clean the area free of pus and other discharge. Use cotton piece soaked in the warm saline solution and dab it on infection. Consult a doctor and follow his advice. The size of the ornaments in the initial phase should be 1.2mm to 1.4mm. After the wound recovers, the jewelry can be larger or smaller as per the choice. The material of the jewelry should ideally be Gold, Sterling silver, surgical steel, titanium or niobium as they are hypoallergic and non-corrosive. They will not cause itching or irritation. 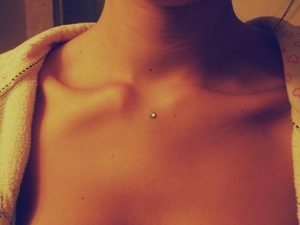 It is a variation of micro dermal piercing. The charges will fall in the range of $40 to $120 in any elite salon. Selection of jewelry can sway the prices.